It’s been perfect weather up here on the Ridge for getting stuck into a few dark ales – cold, windy and rainy. 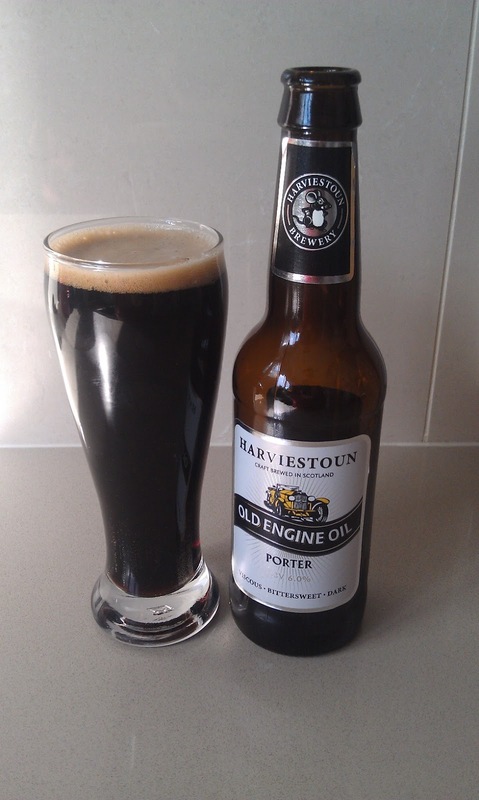 So, welcome to the first winter Sunday Sesh, brought to you by Harviestoun Brewery’s Old Engine Oil Porter. Well, this certainly looks like engine oil, but it does have some carbonation, hence the short, creamy head. Tastes a little of burnt caramel, and sweet like a good porter should. There’s a hint of chocolate, but there’s a most interesting aftertaste – vegemite. I guess that’s because vegemite is a yeast-based product, but it was funny being able to taste the stuff I used to eat by the bucket-load for breakfast when I was a kid. Anything that tastes like an Aussie staple is alright in my book. I really like this beer, but would maybe stop at two or three. It’s quite heavy to drink, as in thickish compared to summery lagers, so fills you up quite quickly. A side note on this, as I mentioned in an earlier post, the Porters were named after the transportation workers (porters) who enjoyed this type of beer in 18th century London. Apparently, they used to make a meal out the beers. And I can see why, as these types of ales fill you up fast. A great beer to kick off the winter Sunday Sesh’s. A couple of things caught my eye this week. The first was this news about swing bowling in cricket. Apparently some scientists discovered that it’s not moisture in the air that causes swing. I think those scientists haven’t been to a test match in Brisbane. When the humidity’s high at the Gabba, that red ball is practically moving 90 degrees as can be seen by the very first ball of the 2006 first test delivered by Steve Harmison. One commenter on this video said that maybe it was a tactic by England – to get the ball to Freddy Flintoff as soon as possible. It’s a shame that tactic didn’t quite work. We won that series in a white-wash. The other thing that caught my eye was this mash-up from youtube. It’s a very clever look at the goal celebrations in football (that’s the round ball game), and adding in some Hollywood-style FX. Some of the world’s best players are known just as much for their celebrations as the goals they score. So I’ll leave you with this little piece of brilliance to finish of the Sesh. My favourite is the accordion playing ‘keeper. Next week, I’m trying out Monteiths Black Beer, a drop from our cousins across the ditch. The last time I had a Kiwi beer, I wasn’t impressed. I have had a Monteiths before when I holidayed in Queenstown and it wasn’t too bad. I’m looking forward to this one, since it promises lots of caramelly, chocolatey, nutty, and coffee goodness.